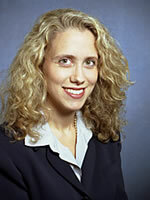 Rebecca Silberstein, a partner of the Investment Management Group at Debevoise & Plimpton LLP, focuses on advising investment banks, financial institutions and boutique firms as sponsors of leveraged buyout, international private equity, merchant banking and other private investment funds. She is ranked in the top tier of Chambers USA (2008) for private equity fund formation and is listed as a leader in the field by The International Who’s Who of Private Funds Lawyers (2008) and PLC Which Lawyer? Yearbook (2007). Ms. Silberstein is a frequent speaker at seminars and conferences, including The Private Equity Analyst’s Raising a Fund in 2007, Thompson Financial’s Private Equity 2006 and 2007: What You Need To Know, Institute for International Research’s Private Equity Fund Formation and Operations and Practising Law Institute: Doing Deals. She represents numerous private equity clients, including Kelso & Company, Merrill Lynch, Morgan Stanley, Och-Ziff Capital Management, Ripplewood Holdings and Stone Point Capital.